Personality: Enjin is a fast paced easy going person. He likes to have fun, be sarcastic and make fun, but doesn't like to actually hurt feelings. Because of this he tends to cross the line and apologize allot, but he doesn't mind. When he gets his mind set on something, even though that happens rarely, he becomes over passionate, and he is always stubborn. If asked to describe himself he would say he’s like two people in one, and both have multiple personality disorders. Appearance: Typically shirtless, this boy likes his freedom and expresses sit by only wearing baggy pants and shorts. held tight to his waist by rope, more often then belts. Due to his bloodline he has his top and bottom k-nines elongated, round monkey ears, and a very versatile tail. History: A rowdy boy from birth, Enjin was always courageous and outgoing. 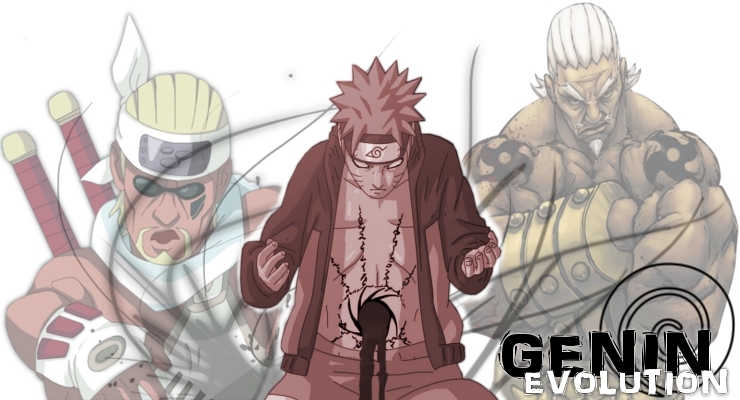 He went into the academy with his head held high and high imbissions... Once the real world settled down on him, he was happy it didn't beat him down, and he managed to become a Genin. It was during this time he was able to come into his Kekkai Genkai. He was on mission in a forest when he came across a small pack of monkeys, whom of which became very curious with him and ended up following him. At first he thought they were cute, then a hindrance. Finally, at a time he was separated on a C rank mission gone wrong, the two monkeys wound up helping him take down an enemy ninja. He began to bond with them, and now they are his sidekicks.. kinda. After spending some time with them he became bonded to them, somewhat literally, growing the features he now has. Is ambitions are now to become a chuunin. Other: Enjins Kekkai Genkai allows him to meld with an animal he becomes particularly close to. He is considered a prodigy since he is the only person to ever merge with two animals (Tang & Wu). The changes to his body allows him to use his feet as hands, gives him a strong prehensile tail, and monkey ears with acute hearing. He also can speak many primate languages fluently (Lemur, Gorilla, etc). Item Description: This is what Enjin makes his weapons out of. It wase made by steming a very large piece of wood for several days until it became extremely pliable. At that point it was cooked in a furnace that caused it to shrink instead of burn because it was still soaked. As it hardened it was treated with chakra to be of utmost strength and superiority. All that was left of the tree was a long rod about 3.5 inches in diameter with a length over 40 feet, and a toughness and flexability that rivals un-enforced steel. Enjin keeps this at his house to make weapons with. Item Description: Enjin bears two of these handy weapons. They are made of his hardened lumber, and have an extra layer of bamboo on the outside of them for protection. The staves are 5'8" and have a connecting point in the center. They are tipped on a foots worth of the bamboo on both ends with chakra reinforced steel, this steel is rounded at the tip and covered in inch long spikes. If disconnected and split into halves at their center, the chakra reinforced steel chain on the inside that links them would be revealed. Where the chain connects to both ends there is a mark of summoning kanji. This kanji allows the chain to extend and retract if needed by releasing more chain. Item Description: Made of Enjins hardened lumber, and sleeved in bamboo for extra protection this naginata is similar to a herald or lance. Half stave and half sword, its blade and tsuba are chakra reinforced and stretch its total length to 6'4". Item Description: Wu is Enjins monkey companion. He is a spider monkey who weighs almost 60 lbs and stands at almost 5 feet(awkwardly stretched). His arms and legs are each about 4 feet in length, his tail is 5 feet and prehensile, and he is covered in an almost black, gray hair. Wu is the faster more agile monkey. Item Description: Tang is Enjins monkey companion. He is a baboon that weighs around 110 lbs (all muscle), and stands at about 4'6" (awkwardly stretched). He has a shorter legs than arms by a small amount and a very strong tail. His fangs are 6 inches long on top, and 5 on the bottom. He has a thick, black, pluffy mane from head to chest (used to hide items), and the rest of his body is covered in a near black, gray hair. Tang is the stronger, tougher monkey. Description: Enjins bloodline allowed him to merge bodies with two animals. This merge causes him to look and think more like them. This same merge allows him to link with them telepathically as long as they are touching him or inside his body. This basic bond allows for other techniques to take place. Some are the ability for the monkeys to stretch outward from any part of his body when hidden within him, or the fact that he shares injuries with them if they are inside him. Description: This ninjutsu causes a pillar of earth to burst upward from the ground. The overall thickness and height of the pillar ultimately relies upon the users’ douton strength skill.